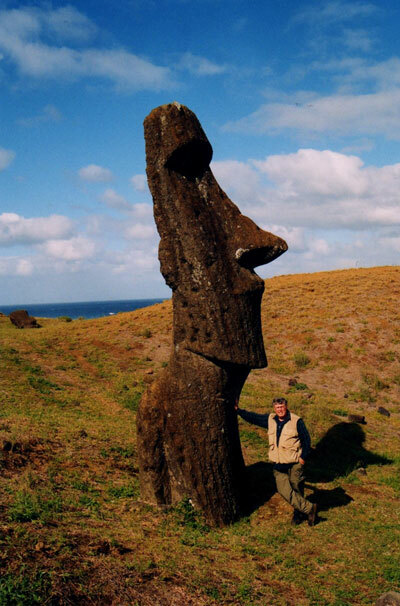 Our fellow pro-science (and some fellow overlapping members) CNY’ers in CNY Skeptics are hosting a lecture on the always-fascinating topic of Easter Island (whether or not the roll of astronomy in navigation to this remote-est location comes up or not remains to be seen). Details are provided below. Rapa Nui (Easter Island) is generally accepted as the most remote permanently populated land area on Earth. It was due to the isolation of Rapa Nui that created the unique culture that developed, especially the 900 giant stone statues called Moai found along its rugged coastlines and Rano Raraku quarries. This lecture will seek to answer the following questions: what were the source and type of rock used to construct the Moai; what kind of tools was used to sculpture the giant statues; how were the statues moved form Rano Raraku to their distant platforms (Ahu); how were the statues placed in their upright positions; and of course; what purpose did they serve? Len Sharp had almost 40 years of experience as an earth science teacher in NY public high schools. He is the past president of the Science Teachers Association of NY and National Earth Science Teachers Association. He is the co-author of a national textbook used for high school earth science. He is a past National Science Teachers Association Distinguished Teacher and received a teaching award from then President Bill Clinton in 1995. He currently is involved with continuing science education for adults and seniors.